The second biggest city in the state of Oklahoma, Tulsa is well known for being a central hub of the American oil industry in the 20th century. In more recent times, the city of Tulsa has since diversified to focus on a wide variety of business sectors and is widely regarded as the cultural hub of Oklahoma and one of the fastest-growing US cities of all. All sorts of kayaking adventures can be enjoyed in and around the city of Tulsa, Oklahoma. Here are some of the top lakes and waterways for you to check out on your next trip to the city. Located just northeast of the city in Rogers County, Claremore Lake is one of the larger bodies of water in the Tulsa area, with a surface area of 470 acres and a shoreline that runs for approximately nine miles. Family-friendly activities like picnic areas and a disc golf course can be found nearby, as well as various docks and boat ramps for easy kayaking. The surrounding scenery provides some beautiful views and the size of lake ensures that even on busy days, you can still find some quiet spots to paddle around. Just south of the city sits Lake Bixhoma. This public reservoir covers 110 acres of land and features three miles of shoreline with several easy-to-access launch sites. It's a popular recreational area for Tulsa citizens and visitors, with many people gathering here at weekends and holidays to kayak, swim, and fish in the lake. 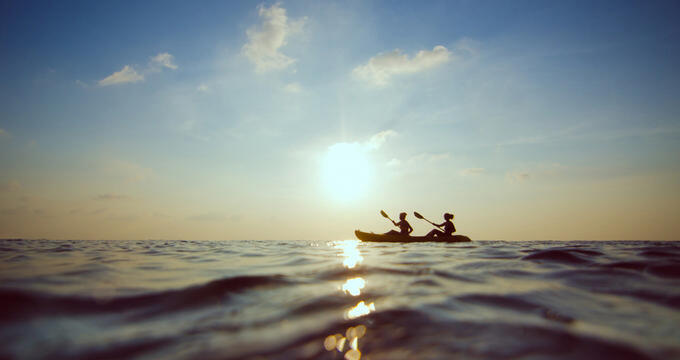 Paddleboarding and kayaking on Lake Bixhoma are very popular activities, with very calm, relaxing waters that can be enjoyed by people of all ages and ability levels. West of the city of Tulsa sits the picturesque Shell Lake. One of the area's hidden gems, Shell Lake is a gorgeous spot to do some kayaking and fishing, highly rated with locals and tourists alike. Some unique rock formations and exciting little grottos can be found around the area and the crystal clear waters are perfect for kayaking. One of the major tributaries of the Mississippi River, the Arkansas River flows right through Tulsa and can provide some thrilling kayaking opportunities, with various rapids and tricky sections found at certain parts of its length, but it can often dry up a little and become too shallow for paddling. One good spot to enjoy some Arkansas River kayaking is at Keystone Lake, just west of Tulsa. Created in 1968, this reservoir is a really popular spot with Oklahoma kayakers. There are currently no guided kayaking tours to enjoy in the city of Tulsa, as the kayaking scene is still growing in the area. However, there are several kayaking outfitters and rental services to be found in and around the city, as well as marinas located on some of the top kayak-friendly lakes in the Tulsa area like Shell Lake and Keystone Lake. Here are some contact details and overviews of two of the top kayaking services and outfitting locations you can find in Tulsa. Not far from the banks of the Arkansas River is Tulsa Kayak, part of the OKC Kayak chain. Offering kayak, canoe and stand up paddleboard rentals and purchases, this is the number one spot in Tulsa to get yourself outfitted with top quality kayaks and kayaking equipment. Every kind of kayak is sold here, from simple inflatable kayaks to fishing kayaks, tandems, white water vessels and more. Located not far from downtown Tulsa, West Marine sells every kind of vessel and piece of equipment you could hope to need for kayaking adventures in Oklahoma. With great low prices and friendly, helpful staff, this is a super spot to cover your kayaking needs, and the West Marine team will be happy to answer any questions you have and provide useful information about kayaking in the Tulsa area.